Immediately after the 1997 Asian financial crisis, the World Knowledge Forum was launched in October 2000 after two years of preparation with the ambition to transform Korea into a knowledge driven nation. Since then, the World Knowledge Forum has taken on the role as a platform for discussions to reduce knowledge gaps through knowledge sharing, and promote balanced global economic growth and prosperity. A total of over 4,000 global speakers and 43,000 audiences have participated since the first forum with the theme of "Shaping the New Millennium with Knowledge" in 2000, and the forum has now become the biggest knowledge festival in the world. Past speakers at the World Knowledge Forum include the following: George W. Bush, 43rd President of the United States of America; Hillary Clinton, The 67th US Secretary of State; Tony Blair, Prime Minister of Great Britain and Northern Ireland (1997-2007); Francois Hollande, President of the French Republic (2012-2017); Nicolas Sarkozy, President of the French Republic (2007-2012); Gerhard Schroeder, Former German Chancellor; Yukio Hatoyama, The 60th Prime Minister of Japan; John Howard, Former Prime Minister of Australia; Jim Y. Kim, President of World Bank; Le Luong Minh, Secretary-General of ASEAN; Bill Gates, Co-founder of Microsoft Corporation; Richard Branson, Founder & CEO of Virgin Group; Michael Dell, CEO of Dell Technologies; Larry Ellison, Chairman and CEO of Oracle Corporation; George Soros, Chairman of Soros Fund Management; Larry Summers, 71st US Secretary of the Treasury; Paul Krugman, Professor at Princeton University; Paul Kennedy, Professor of History at Yale University; Nouriel Roubini, Cofounder and Chairman of Roubini Global Economics; Michael Porter, Professor at Harvard University; Alan Greenspan, Former Chairman of Federal Reserve Board; Joseph E. Stiglitz, 2001 Nobel Prize Laureate in Economics; Gregory Mankiw, Professor at Harvard University. 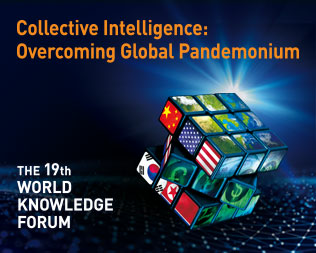 Marking the 19th anniversary of the World Knowledge Forum, around 200 speakers and 3,500 audiences will gather to discuss various agendas under this year’s theme of “Collective Intelligence: Overcoming Global Pandemonium”. Speakers, Janet Yellen, Chair of the Board of Governors of the Federal Reserve System (2014-2018); Kersti Kaljulaid, President of Estonia; Arancha Gonzalez, Executive Director of International Trade Center (ITC); H. R. McMaster, The 26th White House National Security Council (NSC) Advisor of the Trump administration; Fatih Birol, Executive Director of the International Energy Agency (IEA); Rajeev Suri, CEO of Nokia; Kenneth C. Frazier, CEO of Merck & Co., Inc.; John Kim, President of New York Life Insurance Company; Jane Jie Sun, CEO of Ctrip; Wang Zhenghua, President of Spring Airlines; and Eric Allison, Head of Uber Elevate will be present to grace the occasion.